Another middle eastern breakfast under our belts we drove 1 hour to the Sheik Hussein Border. Here we were meeting our rental car people to drop off the car at 10:00am. They duly arrived and we transferred our bags to an awaiting taxi – compulsory to get across the border. We stopped once to scan our suitcases before being deposited a Jordan immigration. 3 JD thank you very much. There we waited behind a busload of Indians on tour, but we struck it lucky that the next transit minibus (another 3 JD thank you very much) was ready to go, so no waiting around, until we got to the Israeli no-man’s land. There we faced immigration. We were prepared for heavy questioning (particularly as Andrew has an Iran visa in his passport) and waited for 20 or 30 minutes while trucks and buses were checked before we were deposited at Israeli our luggage to be searched. But no, it was one question each and straight through. 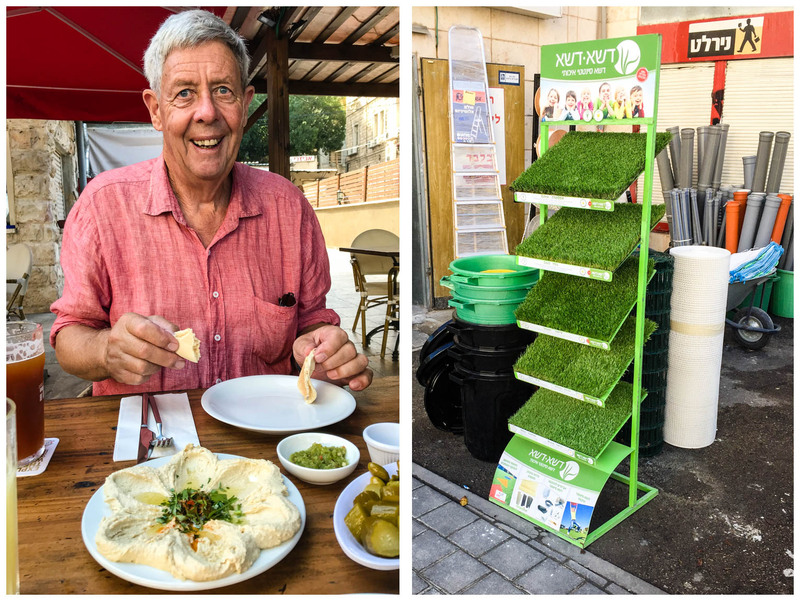 It was so good that we were able to grab a taxi and be on the once hourly train to Haifa with 3 minutes to spare. So pretty much 1.5 hours from start to finish was far better than we had hoped. Immediately from the windows of the train we could see the Israel had harnessed water. On the Jordan side it was generally brown, dry and unproductive, while we were now in high intensity farmland. 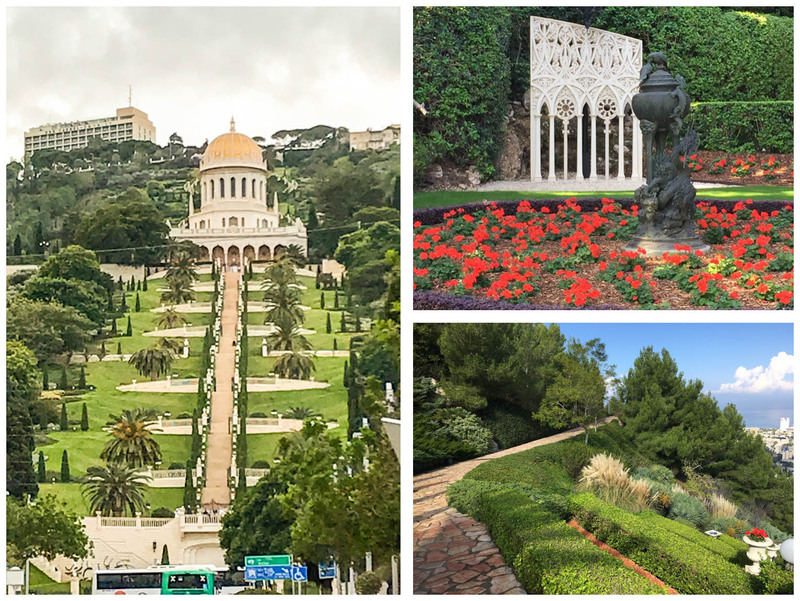 Haifa was only a one night stop and the main reason was to go to the world heritage Ba’Hai gardens tomorrow. So the afternoon we had no major plans except eating and wandering – both of which we managed to achieve. We dropped our bags at Diana seaport apartments and Andrew was hugely fascinated with the complex electronic look on our room door. Every time we went in or out he had to comment ‘I have never seen such a high tech or high security lock ‘ Every time, it was one of those 2 comments! 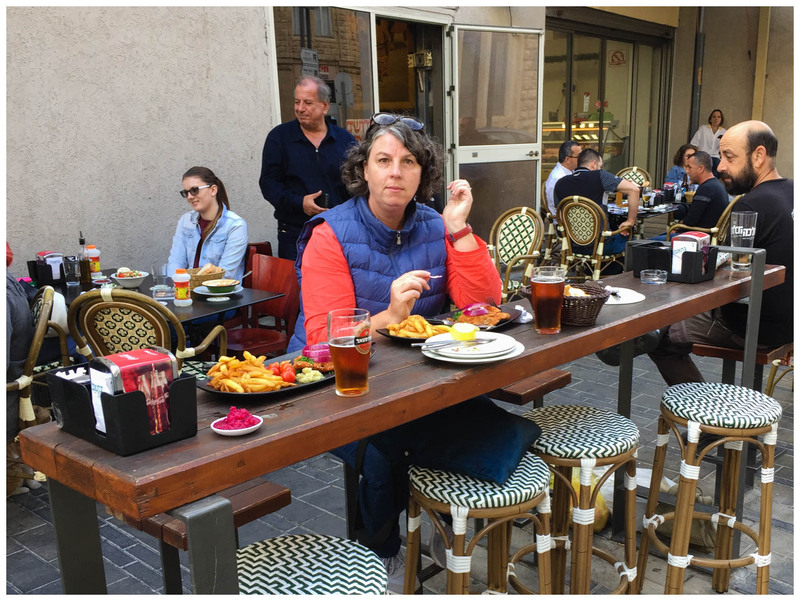 We headed off to lunch around the corner at Maayan Habira , Eastern European. Sitting on the pavement we were back in a developed city. Lunch was huge again and it has been our ‘curse’ for the trip. With a long list of restaurants to try we are only able to do 50% of them because by evening we were still not hungry and just had a light meal. We checked out the German colony and walked until we could walk no more. The next morning we got on the bus to take us up the hill to the gardens. You can see them from the outside, and also from below. But to actually visit them you need to do so as part of a tour. 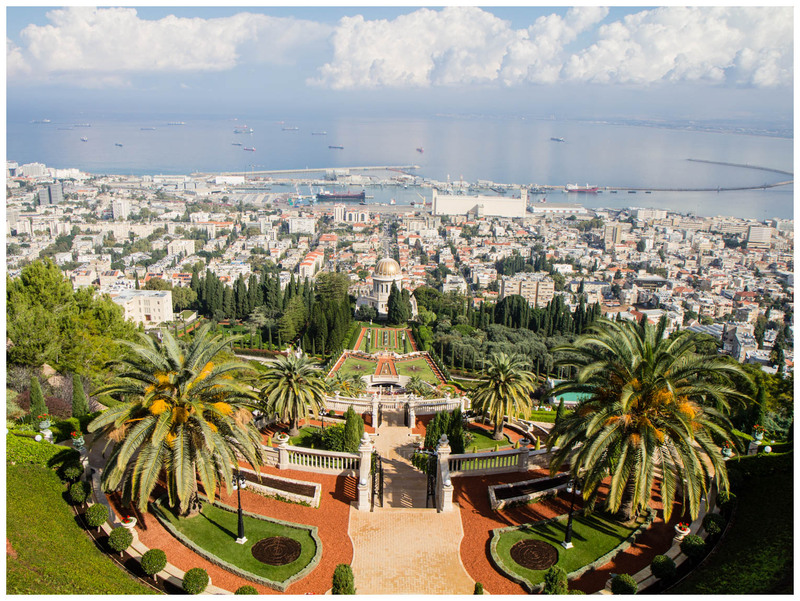 The gardens are a holy site of the Ba’hai faith and you are told about the history and beliefs of the faith as you walk. You are also strictly told, dress modestly, no eating, no cell phones, no smoking, stick with your group and if you don’t think you can walk down 800 steps don’t start the tour. The gardens are very structured, and are heavily manicured and maintained. They are lovely.